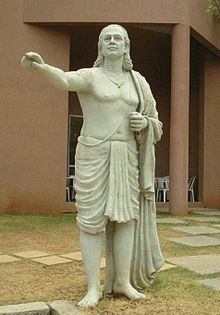 Aryabhata (Sanskrit: आर्यभट; IAST: Āryabhaṭa) or Aryabhata I (476–550 CE) was the first in the line of great mathematician-astronomers from the classical age of Indian mathematics and Indian astronomy. His works include the Āryabhaṭīya (499 CE, when he was 23 years old) and the Arya-siddhanta. In Indian astronomy, the prime meridian is the great circle of the Earth passing through the north and south poles, Ujjayinī and Laṅkā, where Laṅkā was assumed to be on the Earth's equator. In Aryabhatiya quoted in: J J O'Connor and E F Robertson Aryabhata the Elder, School of Mathematics and Statistics University of St Andrews, Scotland. Translates to: Add four to 100, multiply by eight, and then add 62,000. By this rule the circumference of a circle with a diameter of 20,000 can be approached. Thus according to the rule ((4 + 100) × 8 + 62000)/20000 = 62832/20000 = 3.1416, which is accurate to five significant figures. The irrationality of pi was proved by Lambert in Europe in the year 1761. Translates to: for a triangle, the result of a perpendicular with the half-side is the area. In: Arijit Roy “The Enigma of Creation and Destruction”, p. 27 from the Ganitapada, quoted in "The Enigma of Creation and Destruction". His value of π is a very close approximation to the modern value and the most accurate among those of the ancients. There are reasons to believe that he devised a particular method for finding this value. It is shown with sufficient grounds that he himself used it, and several later Indian mathematicians and even the Arabs adopted it. The conjecture that Aryabhata's value of π is of Greek origin is critically examined and is found to be without foundation. He discovered this value independently and also realised that π is an irrational number. He had the Indian background, no doubt, but excelled all his predecessors in evaluating π. Thus the credit of discovering this exact value of π may be ascribed to the celebrated mathematician, Aryabhata I.
Aryabhata is also known as Aryabhata I to distinguish him from the later mathematician of the same name who lived about 400 years later. He is the master who, after reaching the furthest shores and plumbing the inmost depths of the sea of ultimate knowledge of mathematics, kinematics and spherics, handed over the three sciences to the learned world. Bhaskara I, quoted in: J J O'Connor and E F Robertson "Aryabhata the Elder". G Ifrah, in "A universal history of numbers : From prehistory to the invention of the computer" quoyed in in: J J O'Connor and E F Robertson "Aryabhata the Elder". Roger Cooke in: The history of mathematics: a brief course, Wiley, 7 October 1997, p. 207. His work, called Aryabhatiya, is composed of three parts, in only the first of which use is made of a special notation of numbers. It is an alphabetical system in which the twenty-five consonants represent 1-25, respectively; other letters stand for 30, 40, …., 100 etc. The other mathematical parts of Aryabhatiya consists of rules without examples. Another alphabetic system prevailed in Southern India, the numbers 1-19 being designated by consonants, etc. Florian Cajori in: A History of Mathematical Notations, Courier Dover Publications, 26 September 2013, p. 47. Aryabhata is acknowledged as one of the astute astronomers of early India. His school of astronomy is well known and widespread all over India, especially in the South...Of late there is a tendency to spell his name as “Aryabhatta”. While Aryabhata himself mentions Kali 3600 to be the date of his composing the work, some say that Kali 3600 is the date of his birth. A view has been broached that Aryabhata hailed from Kerala. Of late, there has been a tendency to spell the name as “Aryabhatta” with the sufﬁx “bhatta”. Two artiﬁcial satellites sent up into space by Indian scientists are given the names “Aryabhatta I” and “Aryabhatta II”. Some modern writers also make use of this spelling. The second reason adduced, viz., that Aryabhata should have hailed from Kerala is fragile. Besides the Aryabhatan system being prevalent in this land,-“all” commentaries on Aryabhaﬂya have been produced by Kerala astronomers really does not stand scrutiny. He hailed from the Asmaka country, which comprised the present South Gujarat and North Maharashtra, through which the rivers Godavari and Narmada ﬂowed. He ﬂourished at Pataliputra (modern Patna) in the ancient Magadha country (now Bihar) where he composed his works, the 'Aryabhatiya and arya-siddhanta'. He was a celebrated astronomer and mathematician of the classical period of the Gupta Dynasty...He played an important role in shaping scientific astronomy in India. He is designated as Arayabhata I to differentiate him from Arya Bhata II who flourished much later (ca. AD 950-1100) and who wrote the Mahasiddhanta. His fame rests mainly on his Aryabhatiya, but from the writings of Varahamihira (Sixth century AD), Bhaskara I, and Brahmagupta (seventh century) it is clear that earlier he composed the Aryabhata Siddhantha (voluminous) is not extant. It is also called Ardharatrika Siddhanta, because in it the civil days were reckoned from one midnight to the next; 34 verses on astronomical instruments from this have been quoted by Ramakrishna Aradya. Aryabhatiya, an improved work, is product of mature intellect, which he wrote when he was 23 years old. Unlike in the Aryabhata siddhanta, the civil days are reckoned from one sunrise to the next, a practice which is still prevalent among the followers of Hindu calendar. An Arabic translation of the Aryabhatiya entitled Zij-al-Arjabar (800 AD) is attributed to Ahwazi. Use of better planetary parameters, the innovations in astronomical methods, and the concise style of exposition of Aryabhatiya makes it an excellent text book on Astronomy. As opposed to the geostationary theory, Aryahabata held the view that the earth rotates on its axis. His estimate of the period of the sidereal rotation of earth was 23 hours 56 min, and 4.1 s is close to the actual value. He was the father of the Indian cyclic astronomy which resulted in the planetary theory that determines more accurately the true positions and distances of the planets (including the Sun and the Moon)...was also the first to produce celestial latitudes...proposed the scientific cause of eclipses as against the mythological demon Rahu [Moon's node]. His ideas resulted in the new school of Indian Astronomy – the Aryapasha ((Aryabhata School) based on the text of Aryabhatiya. The development of Indian trigonometry, based on sine as against chord of the Greeks, a necessity for astronomical calculations with his own concise notation which expresses the full sine table in just one couplet for easy remembrance. One of the two methods suggested by him for the sine table is based on the property that the second order sine differences were proportional to sines themselves. In geometry his greatest achievement was an accurate value of π. His rule is stated as: dn^2+(2a-d)n=2s, which implies the approximation 3.1416 which is correct to the last decimal place. The apparent motion of the Sun along the ecliptic (red) - With Kala-kriya he turned to astronomy — in particular, treating planetary motion along the ecliptic. ...he flourished in Kusumapura—near Patalipurta (Patna), then the capital of the Gupta dynasty — where he composed at least two works, Aryabhatiya (c. 499) and the now lost Aryabhatasiddhanta. Aryabhatasiddhanta circulated mainly in the northwest of India and, through the Sāsānian dynasty (224–651) of Iran, had a profound influence on the development of Islamic astronomy. Its contents are preserved to some extent in the works of Varahamihira (flourished c. 550), Bhaskara I (flourished c. 629), Brahmagupta (598–c. 665), and others. It is one of the earliest astronomical works to assign the start of each day to midnight. Aryabhatiya...written in verse couplets ...contains astronomical tables and Aryabhata’s system of phonemic number notation, the work is characteristically divided into three sections: Ganita (“Mathematics”), Kala-kriya (“Time Calculations”), and Gola (“Sphere”). In Ganita, he names the first 10 decimal places and gives algorithms for obtaining square and cubic roots, utilizing the decimal number system. Then he treats geometric measurements — employing 62,832/20,000 (= 3.1416) for π—and develops properties of similar right-angled triangles and of two intersecting circles. With Kala-kriya he turned to astronomy — in particular, treating planetary motion along the ecliptic. The topics include definitions of various units of time, eccentric and epicyclic models of planetary motion (see Hipparchus for earlier Greek models), planetary longitude corrections for different terrestrial locations, and a theory of “lords of the hours and days” (an astrological concept used for determining propitious times for action). ...spherical astronomy in Gola, where he applied plane trigonometry to spherical geometry by projecting points and lines on the surface of a sphere onto appropriate planes. Topics include prediction of solar and lunar eclipses and an explicit statement that the apparent westward motion of the stars is due to the spherical Earth’s rotation about its axis. He also correctly ascribed the luminosity of the Moon and planets to reflected sunlight. This page was last edited on 17 February 2019, at 11:55.